Slightly larger in diameter than the common 6-48 scope base mounting screw. Most holes "ruined" while drilling or tapping can be fixed; just retap to .146"-48 and install. No need to redrill base or gun. Thanks to Doug Knowt for his tip. Click Here for taps. 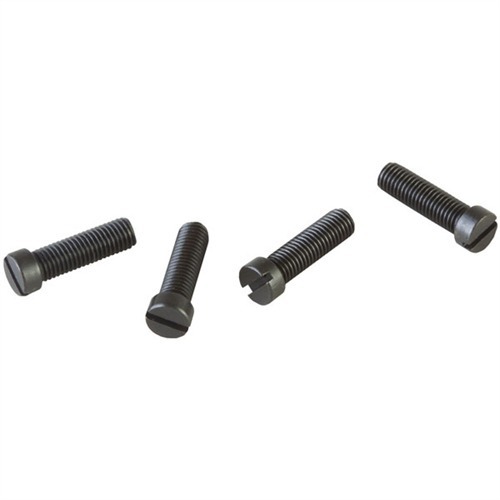 SPECS: .146"-48x½" (12.7mm) slotted machine screws, blued finish. Fillister and Weaver-style head. Kit contains 48 of each style, 1 taper tap, 1 bottom tap, and 1 Screw Gizzie in a bench box. Litt større i diameter enn vanlig 6-48 omfanget base montering skruen. Flest hull "ødelagt" mens boring eller trykke kan være fast; bare retap å.146"-48 og installere. Du trenger ikke å redrill base eller pistol. Takk til Doug Knowt for hans tips. Klikk her for kraner. Spesifikasjoner:.146"-48x½" (12.7 mm) spor maskin skruer, blånert ferdig. Linsesylinder og Weaver stil leder. Kit inneholder 48 av hver stil, 1 taper tap, 1 bunn trykk og 1 skrue Gizzie i en benk. 8-40 Torx screws into a Remington 1100 stripped out the receiver. These screws, combined with the .146"-48 tap worked perfectly! As noted in tips description by Mr. Doug Knowt, no need to re-drill. Just run the tap through, install the oversize screws, and your done! The screw heads were exact size as Torx, and the screws were plenty long enough to grind to fit any application. Thanks Brownell's! Thanks Mr. Knowt! I used these in conjunction with the required tap to fix the scope base screw holes in a Remington 597 receiver. The screw holes were a bit oversized as it came from the factory with only .002" of thread engagement. I used these in conjunction with the associated tapered tap to fix the scope base screw holes in a Remington 700 receiver. The front two screws from the factory were stripped and would just spin. I had to drive them down through the holes after removing the barrel. The tapered tap did its' job by hand. Used the tap and a 1/8" drill bit on a piece of O-1 steel to allow me to cut and file the screws down to size. The only issue with these screws is the slotted head. My Burris XTR steel scope base calls for 35 in lbs of torque and the little slotted screw head wouldn't hold the bit all of the way to 35 in lbs of torque. A socket head or torx head would do the trick and would have made this solution perfect. Very happy overall though, I recommend this solution for stripped receiver scope base holes. This kit was great and easy to use. A friend and I purchased after both had stripped out screws on Ruger 10/22 receivers. Bought this kit and the proper drill bit. Shortly after had new threaded holes in the receiver and scope rails mounted, with much less torque this time. Used Brownells video on how to make a screw jig from flat stock instead of using the gizzie. Have fixed 3 other receivers for a buddy at the local gun shop and more than paid for the kit. I used the kit to repair a Ruger 10-22 with a stripped scope mount/receiver screw. I only fixed the damaged screw hole. (Hey, if it isn't broke, don't fix it) The Kit comes with 2 taps, one gizzy and a bunch of screws. Useless instructions. The tap with a point is the taper tap, and you use it for holes that go all-the-way through, and you use it to start all holes because you need the pointed end to initiate the holes. The bottom tap is the one with the blunt end. You would use it for holes that do not go completely through. Again, start with the pointed tap. The kit does not come with a handle, so I bought a cheap 3-piece kit from Harbor Freight for $7.00. I clamped my receiver in a padded vise, made it as level as I could, sprayed a bit of WD-40 on the tap and in the receiver screw hole, and turned it in by hand with the taper tap. Easy as pie. The Gizzy wasn't threaded, so I ran the taper tap through the small hole on the gizzy, and then threaded one of the screws in until it was about the same length as my factory scope mount screws. I didn't measure it (I should have). About a minute on my grinder, and I checked the fit of the screw using the scope mount and 10-22 receiver. Make sure the screws don't extend too far into the receiver, because the bolt with make contact with it. Overall, it's a pretty simple kit, and I don't have to ship the gun back to Ruger or take it to a gun smith. They include enough screws to repair a few dozen rifles. According to Ruger, don't use Loc tite on the 10-22. Evidently, it adds a bit of pressure, and is the cause of countless stripped receivers. Good luck. Purchased a 541S at the local gun shop,not realizing three of the four base holes were stripped until trying to mount a base..This kits bottoming tap and the included oversize screws(after shortening to length) saved the day..Worked perfect,worth every penny. Thanks Brownells! 1 Dz. Fillister .146"-48 Screws Litt større i diameter enn vanlig 6-48 omfanget base montering skruen. Flest hull "ødelagt" mens boring eller trykke kan være fast; bare retap å.146"-48 og installere. Du trenger ikke å redrill base eller pistol. Takk til Doug Knowt for hans tips. Klikk her for kraner. .146"-48 Shop Kit Litt større i diameter enn vanlig 6-48 omfanget base montering skruen. Flest hull "ødelagt" mens boring eller trykke kan være fast; bare retap å.146"-48 og installere. Du trenger ikke å redrill base eller pistol. Takk til Doug Knowt for hans tips. Klikk her for kraner. 1 Dz. Weaver .146"-48 Screws Litt større i diameter enn vanlig 6-48 omfanget base montering skruen. Flest hull "ødelagt" mens boring eller trykke kan være fast; bare retap å.146"-48 og installere. Du trenger ikke å redrill base eller pistol. Takk til Doug Knowt for hans tips. Klikk her for kraner.